This Sunday- we will return to our roots- and run at El moro :) the 25k group will run 8 miles and the 50k group will run 10miles. We will be doing some single track running along fenceline and thru emerald canyon with a return down boomer- the weather should be nice and cool. Lets try to get going by 7am for the run. See everyone Sunday. This is just a reminder that this Sunday we will meet at Cooks Corner at 6:45am then carpool about 1/4 mile up the road because there is limited parking... please arrive on time. The 25k group will run to the flag 6 miles and the 50k group will continue another 1 mile past the flag then return to the start for a total of 8 miles. On the return back to the cars it "mostly" downhill :) its one of our favorite runs and we can't wait to share it with all of you. We wanted to take this time to acknowledge Tom, Amy, Korrin, Donna and Skip for their help at our aid station at Chimera 100k/100 mile- thank you so much for your hard work and effort. It was awesome that we were all there for the runners and helping them through a difficult course and the weather elements. Thank you! We had mentioned that we might want to start the 50k and 50 mile class earlier than the 7am class when we are running more than 16 miles. After reviewing the race's and talking about it, we have decided to do just that. Let me explain why since I know some of you were not keen on this. The whole reason we "should" be going to bed early, waking up early, testing out our food prior to our training runs, wearing whatever outfits we are going to run in, eat whatever on the run, and ALL of that, is to prepare you for your RACE day! Most people cannot just go out and run a Marathon, or a 50k, and especially a 50 mile or more without proper training, and that includes all of the above. The race director isn't going to wait for you to wake up and start the race at 10am because you were out partying the night before. All of this training is for you to accomplish your goal of running your goal race. For the 50k'rs, Northface race starts at 7am, that means being at the race at least by 6am to get what you need and be ready to run by 7am. For the 50 milers running Avalon, the race begins at 5am, which means getting up however early to start your routine and be at the starting line at 5am to run. We do not want to torture you, we simply want to prepare you to do your best. Pete and I used to start at 5am, so for me, i was getting up at 3am, so we thought 6am was a good compromise. :) This way too, we can get a few more miles in and meet the 25k'rs and all be able to run together as a whole group. Great turn out today, I am so happy to see everyone and WOW, everyone is doing awesome! I am hoping you returners welcome our newbies and get to talk to everyone and make them feel welcome, which I know you all will! Our family is growing, and it makes us so happy, you have no idea. I am sorry we were a bit tired from this weekends activity, I know I didn't show it, but I truly was so happy to see everyone. Everyone looked so strong and fit! We are going to have a great class! Some of you got your goody bags today, don't forget, but your training plan and Catalina Marathon entry are inside the Hammer catalog for safe keeping. Please stick to the training schedule we have prepared for you and your goal race, and when filling out the Catalina Marathon entry, remember to turn it in to me because we get a discount on the Marathon. I have to turn them all in together. Also, make it out for $15 less than what the original charge is. you should have gotten your buffs as well, with some goodies. We have some Snails Pace coupons that they graciously gave us to use, but will have to hand them out at the next class for you to use. Great job today! I cant wait for our first Creature feature! Just as a reminder Tmr's run will be at Bruegger's Bagels in RSM, at the same time of 7am for a nice 6 miler. Please be prompt and ready to run by 7am. I am so excited to have started a new class on Saturday! It was great seeing some new faces, and getting to see some familiar faces as well. I hope everyone will be able to make this coming Sunday's run so everyone can meet. This Sunday's run will also be at Bruegger's Bagels in RSM, at the same time of 7am for a nice 6 miler. Please be prompt and ready to run by 7am. Everyone's weekends are busy, and some people have limited time schedules. Speaking of which, when the runs start to get longer, we are going to start the 50k'rs at 6am for a quick run, then meet up with the 25k'rs so we can all finish off together. :) Let me know if there are problems with this, and we can try to work it out. We are also planning on some travel dates so we can run other trails! We are going to try to get those dates to you so you can plan accordingly. I am getting your goody bags together for those of you who have paid, and will have all of your stuff for you this weekend except for your shirts. We will talk about this in class on Sunday. Hi Everyone- I hope you have enjoyed the last few off since our race. You should be resting and gearing up for this weekend. We will be meeting this Saturday at 7am only because we had a prior commitment with our Snails Pace group running the Santa Monica 5 and 10k race. Otherwise all of our training runs will be on Sunday at 7am. Please feel free to invite friends that might be interested in our program. The 25k group will run about 4 miles and the 50k group will run 6 miles. The training plan and goodie bag will be handed out to those members that have paid. We will go over the whole 13 weeks prior to our run and answer any questions you may have. We are really excited about this weekend. Lets get this party started. $125 Program fee includes 13 weeks of training (50K trail training plan). $175 Program fee includes 19 weeks of training (50 Mile trail training plan). $99 Program Fee for Returning Members for 13 weeks (50k trail training plan). 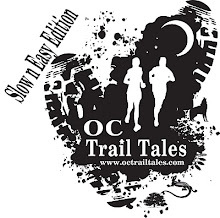 $149 Program Fee for Returning Members for 19 weeks (50 Mile trail training plan). Another part of the game plan was to get rest throughout the day... on one hand it was a great experience to to see how the runners mood would change from station to station. Observing how they bonked, or fumbled (jay or tom) and how the top runner zipped in and out of the aid stations. Marisa needed someone to pace her from mile 50 to 75. There was an option of splitting up the run between Corrinne and I. I opted to run the first 6.5miles then Corrinne had planned to run the other 15 miles. Marisa came into mile 52 feeling sick and had been vomiting since mile 36...she wanted to try to continue. Physically she felt great, legs were fresh, feet were blister free :) but her stomach could not hold anything. It seemed like every 5min we would stop to regroup. My main concern at the time was to get here to the next aid station safely and talk to a medic. The medic did not seem to have any good suggestions other than her vitals were fine...Marisa made the right decision to call it a day. There was no way to continue another 40 miles without eating... so at around 11pm we drove down to the city to continue our last crew meeting point which was around 3:30am... On our way down the mtn. we were following Loraine's husband Bruce aka Zippy because he drove soo fast... anyhow he hit a rock and got a flat tire... we did not know how to use the jack so we all stared at each other for a few min trying to figure it out so Zippy was reading the car instructions... it was soo funny. Once we were set up at the last meeting point we all tried to rest for a few hours then at around 7am we went for breakfast then waited at the finish for Lorraine- she finished at 1:40pm. This was a fantastic road trip experience and we look forward to getting Marisa healthy and to go back next year to finish the race. Congrats Lorraine for you fine finish.